Neovital contains vitamins C, B12, E, folate (vitamin B9) and beta-carotene (provitamin A) in a liposomal form with increased bio-availability. Folate, vitamin C and the vitamins of the B12 group contribute to normal functioning of the immune system, reduction of fatigue and tiredness and normal mental function. Folate and the vitamins of the B12 group have a function in cell division. Vitamins C and E help to protect cells from oxidative stress. Vitamin C and B12 group vitamins contribute to normal energy metabolism and nervous system function. Neovital contains vitamins C, B12, E, folate (vitamin B9) and beta-carotene (Pro-vitamin C) in a liposomal form. According to available scientific studies, vitamins in this form should have an increased bio-availability. If you would like to boost your immune system and contribute to a normal functioning psyche, we highly recommend Neovital available here in the shop. a role in cell division. Who should make sure that there is a sufficient supply of folic acid? Folate or Folic acid (formerly vitamin B9) is very important during pregnancy. It contributes to the growth of maternal tissue during pregnancy and, in particular, minimises the risk of neural tube defects in the growing foetus. A healthy and well-balanced diet contains sufficient vitamins, supplemented by the additional intake of Folic Acid, especially for people who eat few wholemeal products and/or eat an unbalanced diet. has a role in cell division. Who should make sure that there is a sufficient supply of vitamin B12? A healthy and well-balanced diet contains sufficient vitamin B12. Vegans and vegetarians, in particular, should however, ensure that their vitamin B12 intake is sufficient because of the lack of meat consumption. and plays a role in cell specialisation. A healthy and well-balanced diet normally contains sufficient vitamin E. Vitamin E may also be taken as a supplement. As a fat-soluble vitamin, vitamin E occurs mainly in fats. People who adhere to a minimum fat intake regime should take this into account. Beta glucan is a compound of several glucose molecules that are found in the cell walls of fungi and plants. Beta-glucan from the cell walls of baker’s yeast has thorough scientific research backing it up. 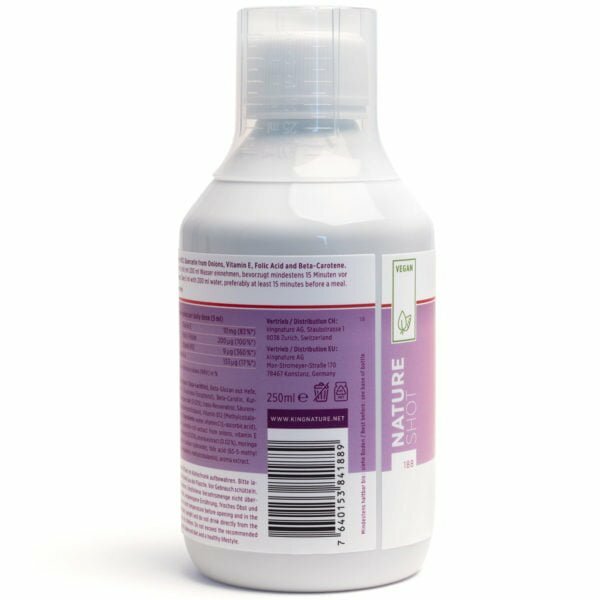 Neovital contains vitamins in liposomal form. According to recent scientific studies, this dosage form suggests an increased bio-availability. We use soy lecithin to “package” the individual vitamins in a liposomal form. A liposome is a small bubble-like structure (vesicle) of tiny size (significantly smaller than a human cell). It is made of the same material as a cell membrane and consists of a fat-loving outer skin that surrounds an aqueous (water-loving) substance. In our processing, we coat the vitamins with a microscopically thin lipid layer. Scientific studies suggest that this liposomal structure increases the likelihood that the vitamins are absorbed by the body. These same studies show that the absorption rate is substantially greater than when taking the vitamin in a dry form. The liposomal coating of vitamin C increases its bio-availability. 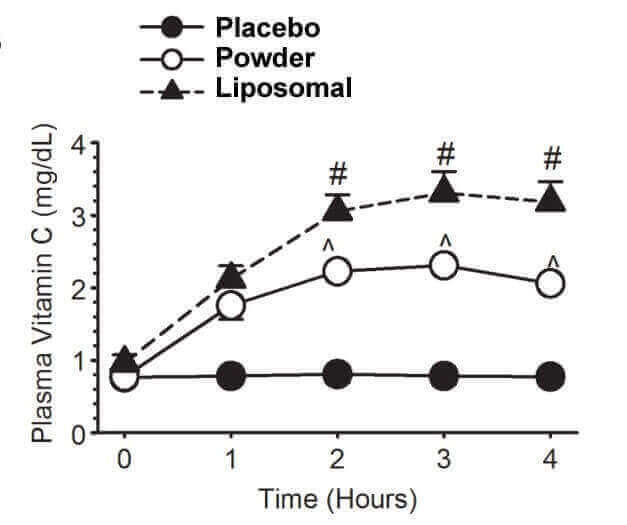 The following study 1 (below) shows the difference in uptake between a placebo, ascorbic acid in powder form and liposomal vitamin C. The curve shows that liposomal vitamin C is clearly best absorbed. This finding is also confirmed by other studies. The measured vitamin C in blood plasma is on average approx. 2 x higher when taken in liposomal form. 1 cf. Davis et al. (2016): Liposomal-encapsulated Ascorbic Acid: Influence on Vitamin C Bioavailability and Capacity to Protect Against Ischemia-Reperfusion Injury, Nutr Metab Insights, 9:25-30. What are the benefits of Neovital? 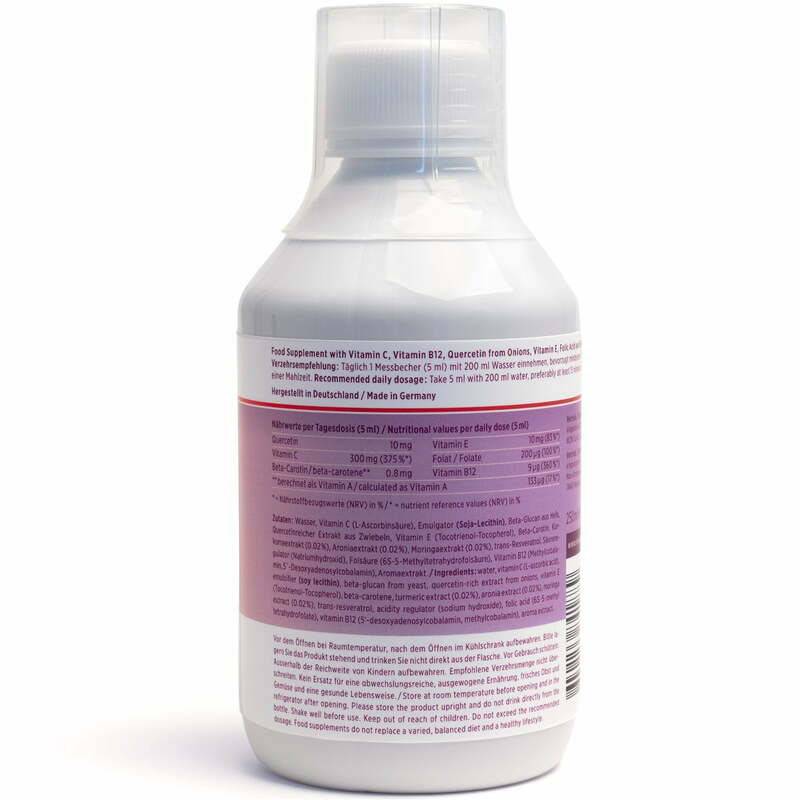 In Neovital, the vitamins are liposomally packaged in soy lecithin. This provides the opportunity for improved absorption. Also suitable for children and persons who cannot swallow capsules. Buy Neovital online now: We also accept Visa / Mastercard and Postcard. Orders exceeding CHF120 are shipped free of charge (within Switzerland). EU customers please use our EU-Shop. 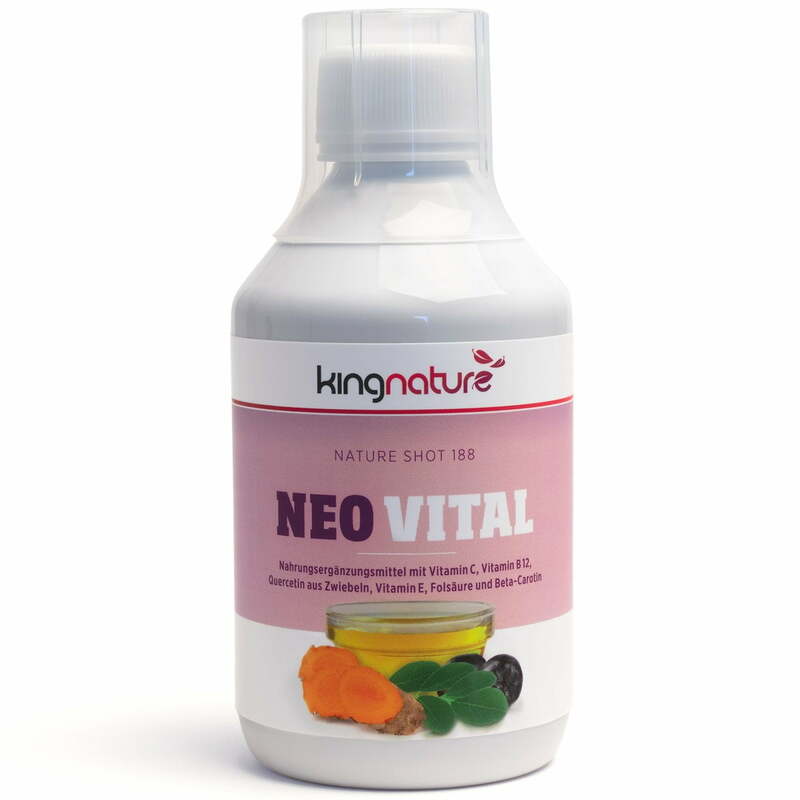 Neovital contains, in liquid form, the vitamins C, B12, E, folate (vitamin B9) and beta-carotene in a liposomal formulation, thus potentially increasing bio-availability. Net contents: 250 ml or 450 ml. Neovital is in stock. Ingredients: Water, vitamin C (L-ascorbic acid), emulsifier (soya lecithin), beta-glucan from yeast, quercetine-rich extract from onions, vitamin E (tocotrienol-tocopherol), beta-carotene, turmeric extract, Aronia extract, moringa extract, trans-resveratrol, acidity regulator (sodium hydroxide), folic acid (6S-5-methyltetrahydrofolic acid), vitamin B12 (methylcobalamin, 5`-deoxyadenosylcobalamin), aroma extract. Neovital is also available at your pharmacy or drug store. Take 1 measuring cup (5 ml) daily with 200 ml water, preferably at least 15 minutes before a meal. Food supplements are not a substitute for a varied, balanced diet, including fresh fruit and vegetables and a healthy lifestyle. Store in a cool, dry place, out of the reach of children. Do not exceed recommended dosage. Fermented herbal and plant mixture and probiotics - 500 ml… ..
Vitamin D3 Vida contains Vitamin D3 (Cholecalciferol) and Coconut Oil from South East Asia. ..
Turmeric with Black Pepper and Green Tea Extract… ..